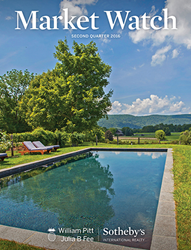 A report detailing second quarter market results for 2016 in Fairfield and Litchfield Counties and the Shoreline in Connecticut, the Berkshires in Massachusetts, and Westchester County, New York, has just been released by William Pitt and Julia B. Fee Sotheby’s International Realty, the company announced today. The report stated that for the first six months of 2016, unit sales exceeded those of the same period in 2015 in every market area the company serves, and that dollar volume was higher in most areas as well. In Westchester County, units were 16% higher county-wide for the first half of 2016 versus 2015 and volume was 13% higher, with similar growth occurring in both the southern and northern counties: Southern Westchester’s unit sales increased by 17% and dollar volume by 10%, while Northern Westchester’s units grew by 16% and dollar volume by 9%. Fairfield County demonstrated unit sales growth county-wide of 7% from the first half of 2015 to the same period of 2016, while dollar volume held about even. The Shoreline held steady with an 18% increase in units, but with sales particularly busy in the lower segments volume increased a smaller 4% compared to the same time last year. Activity in Litchfield County began to accelerate as the quarter drew to a close, with June posting record unit sales and the overall first half of the year seeing a 12% uptick in units and 7% uptick in volume compared to the same time last year. In the Southern Berkshires there were gains of 28% in unit sales and 19% in volume, and notably, the current surge in under-contract properties points to a third quarter that may mirror the explosive first quarter for the region, which saw a significant 63% increase in unit sales with a commensurate 65% growth in volume. The Market Watch pointed out that the lower price points are often driving the marketplace. Moving up the price ladder where there is more inventory, many sellers are adjusting their prices in order to better align with the marketplace, providing significant opportunities for buyers in the luxury segment. The consistent trend in every market is that buyers are usually only interested in those properties they perceive to represent an incredible value in terms of price, condition and location. The report also noted that potentially mitigating economic factors such as Brexit and the coming election may have an influence on certain segments of the market as the year progresses, yet the lower price segments where the bulk of the activity is occurring should remain largely unaffected, and activity is expected to continue through the remainder of the year. The 2016 Second Quarter Market Watch is available for download on the firm’s website, williampitt.com. Founded in 1949, William Pitt and Julia B. Fee Sotheby's International Realty manages a $3.9-billion portfolio with more than 1,000 sales associates in 28 brokerages spanning Connecticut, Massachusetts, and Westchester County, New York. William Pitt and Julia B. Fee Sotheby's International Realty is the largest Sotheby's International Realty(R) affiliate globally and the 28th-largest real estate company by sales volume in the United States. A full-service real estate firm headquartered in Stamford, Connecticut, William Pitt and Julia B. Fee Sotheby's International Realty provides ancillary services including commercial services through its affiliation with Building and Land Technology, a second-generation development company based in Stamford, Connecticut; William Pitt Insurance Services; and an award-winning global relocation division. For more information, visit the website at williampitt.com. Sotheby's International Realty's worldwide network includes approximately 18,000 sales associates located in approximately 825 offices throughout 61 countries and territories.